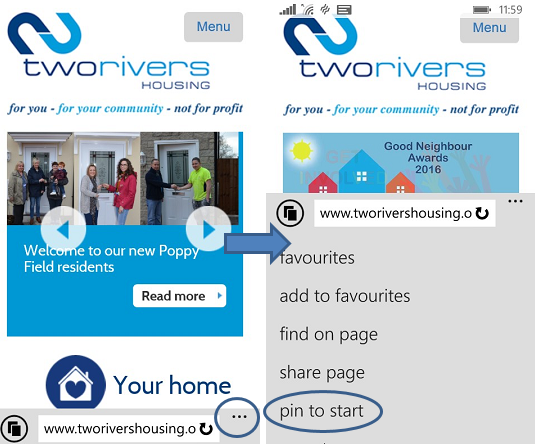 It’s easy to create a shortcut to the Two Rivers Housing website so you can access it straight from the Home screen of your mobile device – just like an app! 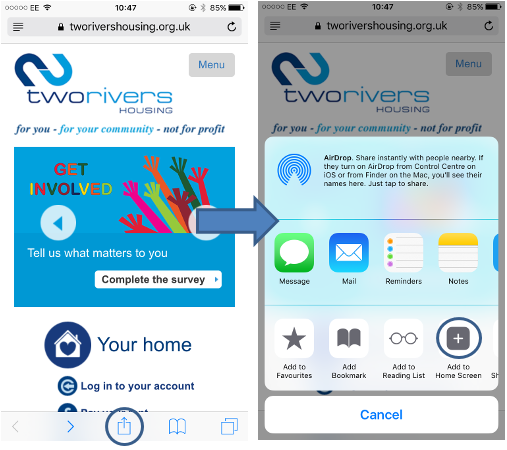 Whether you have an iOS, Android or Windows device, you can do this in less than a minute, making it even quicker than ever to return to the Two Rivers website again, and again and again. Just follow the instructions below according to your device. Go to the Home page of our website. Tap the ‘Share’ button on the Safari browser toolbar — that’s the rectangle with an arrow pointing upward. Tap the ‘Add to Home Screen’ icon in the ‘Share’ menu and, on the final screen, click ‘Add’. Tap the ‘Menu’ button on the Chrome browser toolbar – that’s the three dots icon located within the address bar. Tap ‘Add to Home Screen’ on the menu that appears and, on the final screen, click ‘Add’. 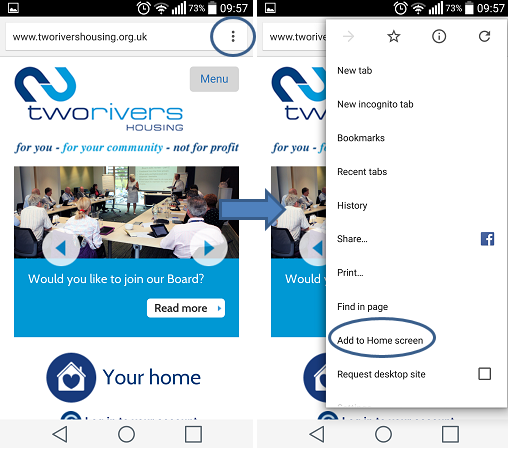 Tap the ‘More’ button on the Internet Explorer browser toolbar – that’s the three dots icon located next to the address bar. Tap ‘Pin to Start’ in the menu that appears.